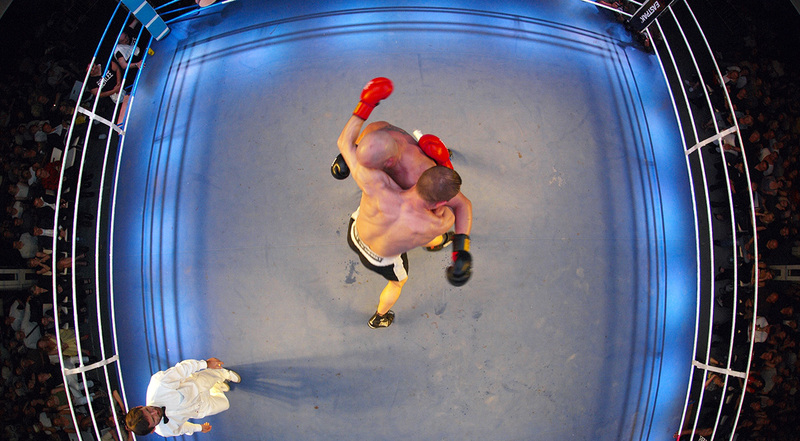 The rules are fairly straight forward: two people fight each other in eleven alternating rounds of chess and boxing. Starting with four minutes of chess, there are a maximum of six chess and five box rounds. The result is decided when an opponent is either deemed incapable to continue in the ring, or when the game ends on the board by chess mate. We are watching the guy with the bleeding head, moving the rooks around in the 7th round, and indeed, he is very close to win the game. Just about a few moves in fact. But then the bell rings, loud Prodigy fills up the room and the two opponents stand up to get their gloves on. You can touch the tension: the situation on the chess board leaves the big guy with only one chance now, to knock his opponent out in the next round. Or, at least, knock the plans out of his head, together maybe with all the knowledge about how the rooks are meant to move about. 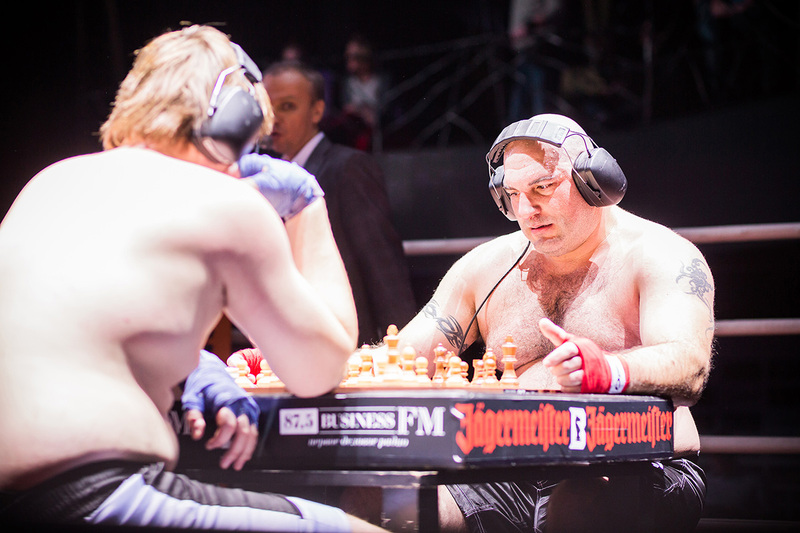 Chess boxing sounds like a joke but it isn’t one. The punches do hurt, the pain is real as is the humiliation after a bad move and loosing the queen. But, just like in real life, a good strategy can even out the chances. The geek kid who never cared for the physical education class has the chance to outsmart the bully on the chess board. And the bully, by all means, can beat all the smart out of the smarty pants. This is the perfect combination of power and brain, manly and nerdy. It is also amazing to see what sorts of backgrounds the players come from. There are riot cops, sailors, professional boxers who had someone in their family teaching them the ins-and-outs of chess. And there are folks who happened to grow bigger than average, taking their kickboxing hobby very seriously during high school and university, while maintaining their brain capacities. And the bully, by all means, can beat all the smart out of the smarty pants. It is the perfect sport then for most men to watch, and as it is, the arena is packed mostly with men, slightly on the nerd side. I am indeed, together with friends who are managing tech teams (although, as I am told, there are women among the players as well). And what a perfect origin story for a sport like this as well: it has been invented in a comic book. Enki Bilal is a Serbian cartoonist legend. In his hardcover book, “Alexander Nikopol — Gesamtausgabe” he tells a story of an utopia from the year 2034, where violence reaches high levels in a post-apocalyptic society. People play ice hockey with steel pock and blade-sticks. In Enki’s comics, boxing is set on a chess board ground, and in the end of the match the winner gets to hammer his opponent with the queen. This is of course no fun sport to do yet. 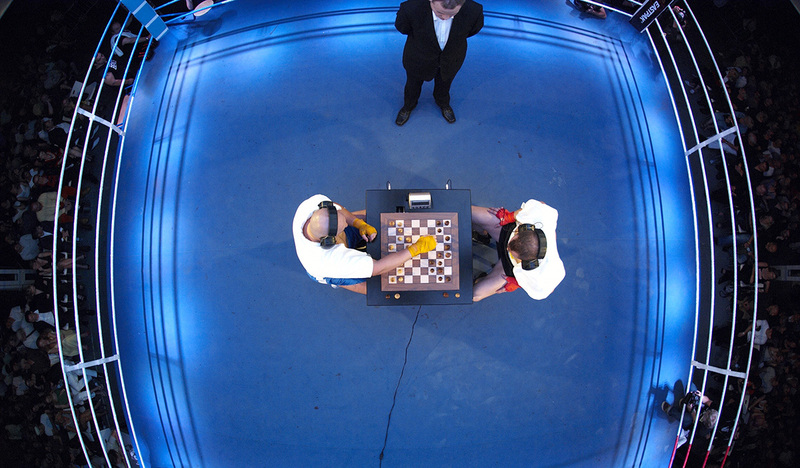 The Dutch artist, Iepe Rubingh was the one who organised the first real chess boxing event in 2003, and in fact, he was the one who came up with the rules for an actual sport. And what a fantastic one! The well engineered rules make the game: whenever someone has an advantage on the chess board, it is almost sure that he is going to have a disadvantage in the ring. This creates fantastic dynamics for the game, and an environment where motivations and strategies change with the wind. The chess board is projected onto a big screen so that the audience can follow the game. Then, while the fight music is setting the mood, people warm up and start shouting for the players. The best sport to watch really. It is still early in the life of chess boxing, but there are a few clubs already all around the world. Rubingh said before in an interview that he wants to solve the world’s politics via chess boxing, for example, holding a match between an Israeli and a Palestinian guy, where the winner gets to decide what happens to Israel. Well, I am not so sure if that was a good idea. Rubingh also says chess boxing could be an olympic sport. That, I couldn’t support more.